This inverter can be used to power your CPAP in your car — great for camping or hunting trips. 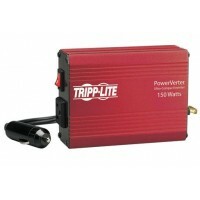 The inverter will beep when the battery is running low so you don't accidentally drain your car battery completely. When you aren't using the inverter for your CPAP, use it for other electronics. It’s not just for CPAPs. This handy device will power any electronics under 150W. You can also use the inverter to connect your ResMed machine to the C-100 CPAP battery. Then you can use it to charge the battery.